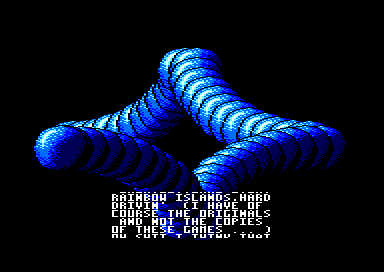 This was intended to become the second part for my first big megademo on the Amstrad CPC. 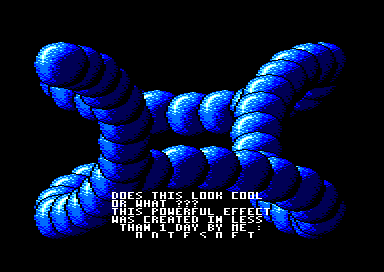 This effect was very common at that time and I hadn't seen a good implementation of it on the CPC. 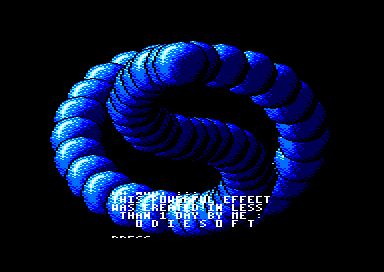 So I took it on to be the first CPC coder to create this "ball-snake" effect. 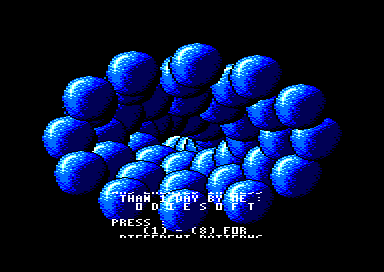 This animation is basically just a flipping of screens where the balls are slightly moved into a certain direction. The trick that makes this animation believable as a continuous motion is to use more than just two different screens. Since the CPC isn't blessed with much memory it is hard to save enough memory to be able to use three screens. 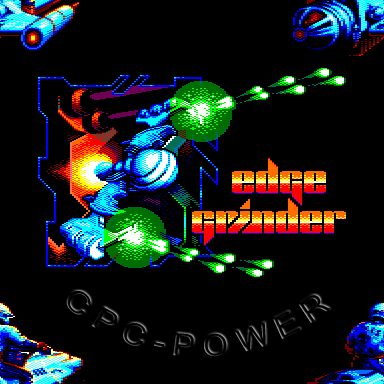 So the CPC demos using this effect at that time were just flipping between two screens. 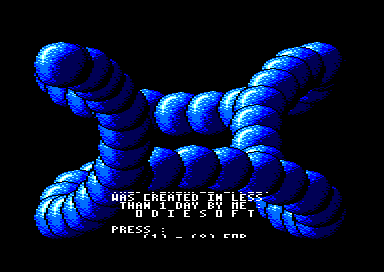 I managed to put the ball graphics, the sound, the program, eight different snake-forms and some scroll text into 16 kilobyte of memory, so that I had 48 kilobytes free for the animation, i. e. three different screens. So balls in this demo look like they are performing a continuous motion. I admit, some of the eight different waveforms I've created don't look this good. The problem with these forms was, that they needed to have a definite start and an end point. The animation program wasn't able to create a form where the head of the snake moves around endlessly with the tail trailing behind. And since I was happy with having created this effect in the first place I wasn't in the mood to spent this much more time on programming better waveforms. Back to this demo: As stated above this was supposed to be one of many parts in a planned Odiesoft Megademo in 1991. But unfortunately I didn't release this Megademo or any other (in 1994/ 95 I wanted to release a Megademo called "Dangerous", but never did...). 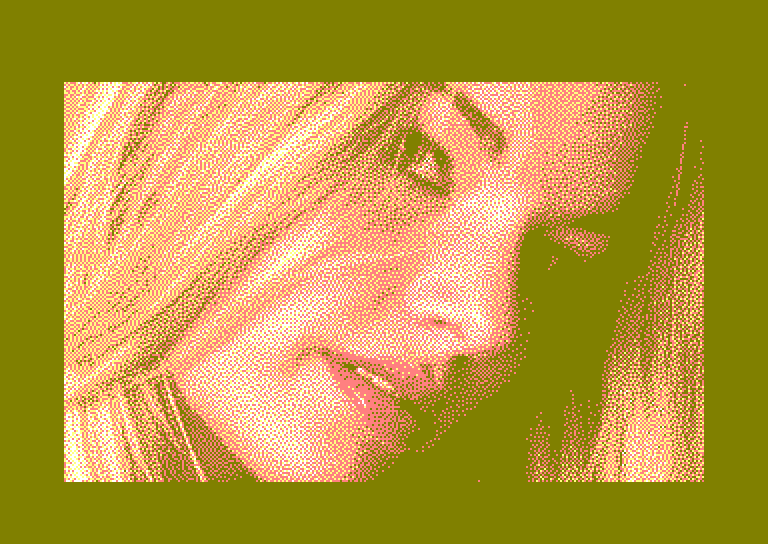 And some years later I thought that this effect wasn't good enough anymore to be released bearing my alias. 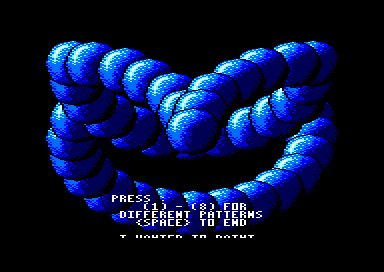 Since I didn't wanted to withold this demo from the CPC audience I finally hid this demo in the updated Shining Christmas Party Demo (the one with the vertical color bars) in the Divine Megademo. To access it you have to press "CTRL", "SHIFT", "CAPS LOCK", "TAB" and "ESC" at the same time.